Born: 1st March 1885, St. Nicholas, Ipswich. Died: 2nd September 1916; age 31. Served 73 days. Residence: 31, Cromwell Road, Ipswich. Enlistment Details: Date:1st March 1916; Age: 31 years & 6 months; Occupation: Labourer; Next of Kin: father – Joseph Bird. Height: 5ft 2 1/2ins. Discharged: 26th June 1916; age 31; No longer physically fit – Delusional Insanity. Originated 4th June 1916 – Stow Langton. Maniacal excitement, delusions that he is being gassed & ill treated. Not a result of & not aggravated by military service. Had no training but acted as Hut Orderly. 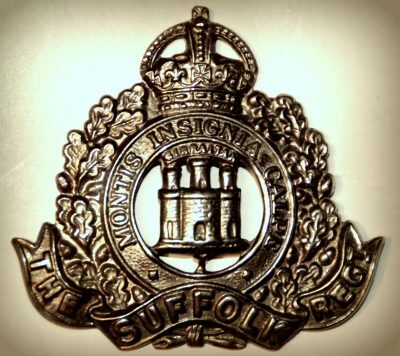 Service Number: 4606; Regiment: Suffolk Regiment, 2/5th Battalion, ‘B’ Coy (T.F.). Brother to EDGAR RAYNER BIRD. 1891 28, St. Nicholas Street, Ipswich. William was 6 years old and living with his parents & siblings. Joseph Bird, 32, a Timber Merchant’s Clerk, born Nuneaton, Warwickshire. Sarah Jane Bird, 30, born Rawul Pindee, Bengal, India. Ethel Mary Bird, 8, born Ipswich. Ellen Maud Bird, 5, born Ipswich. Joseph John Bird, 2, born Ipswich. Edgar Rayner Bird, 7 months, born Ipswich. 1901 29, Cromwell Street, Ipswich. William was 16 years old, worked at a Timber Yard. He was living with his parents & siblings. Joseph, 42, a Timber Merchant’s Clerk. Ethel, 18, a Shop Assistant. Ellen, 15, a Clerk – Drapery Shop. Selina Amelia Bird, 9, born Ipswich. Winifred Grace Bird, 7, born Ipswich. Sidney Arthur Bird, 5, born Ipswich. Stanley Bertram Bird, 4, born Ipswich. Walter Samuel Bird, 2, born Ipswich. baby son, 1 month, born Ipswich (Cecil Bennett). 1911 12, St. Nicholas Street, Ipswich. William was 26 years, a Grocer’s Warehouse Labourer. He was living with his parents & siblings. Joseph, 52, a Greengrocer & Confectioner Shopkeeper – own account. Ethel, 28, a Medical Nurse – own account. Nellie, 25, a Draper’s Clerk. Joseph, 22, a Clerk – Sack Merchants. Winifred, 17, a Confectioner’s Assistant. Stanley, 14, an Office Boy – Coal Merchants.